Twelve beautiful photographs take you through the year-a snow in January, an Easter-egg hunt in April, a picnic in June, a pumpkin in October. Look more closely to see any name you choose; Yours, Mom, Grandma) in each photograph, written in snow, painted on the side of a boat or spelled out in autumn leaves. 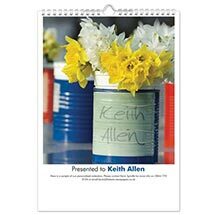 All 12 photographs are personalized with the same name and the calendar begins with any month you choose. 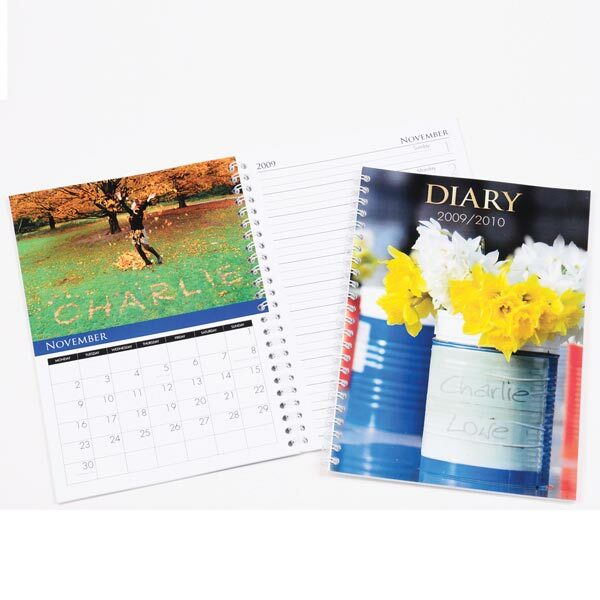 Diary calendar (6"w x 8 1/2"h; 12"w when open), spiral bound. Tell us the starting month and year; specify first name(s) up to 15 characters including spaces. Allow 3-4 weeks. No rush delivery or gift box. Item can only be shipped within the Continental US.